This tapestry "Amalfi Dai Cappuccini" shows a scene of Amalfi coast of Italy of its dramatic cliffs and seaside. This region of Italy is one of the most loved and one of the most scenic. In this tapesty, we see these elements of the coast rendered with a masterful use of light and composition. The mauve hues of the distant cliffs and ocean complements the earthier tones of the path and buildings and also the beautiful greens of the abundant plants and flowers which accompany the villas which line the coastal edge of this idyllic region. This beauty of the Amalfi coast is captured in this tapestry very well. 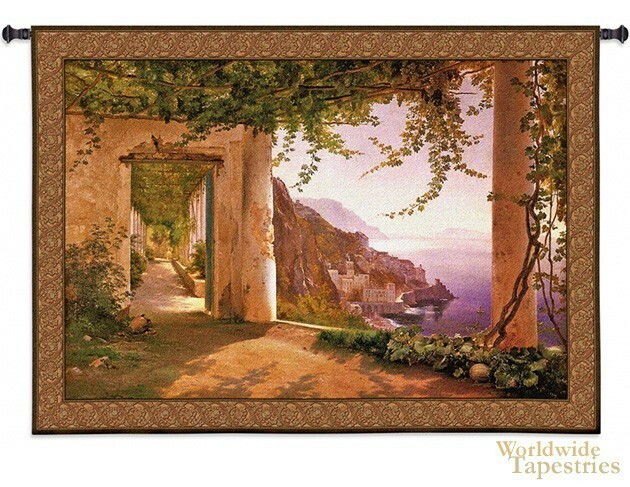 This landscape tapestry "Amalfi Dai Cappuccini" is backed with a lining and has a tunnel for easy hanging. Note: tapestry rods and tassels, where pictured, are not included in the price. Dimensions: W 52" x H 37"
Dimensions: W 78" x H 53"